My refrigerator is usually overflowing with vegetables. When I bring home my farmers market bounties, I’ll get into fights with the tupperware and bottles of hard cider while trying to make room for everything. I tend to use up everything throughout the week, but since I still haven’t mastered cooking for one over the past year, I often have odds and ends of veggies hiding in the back of the fridge. 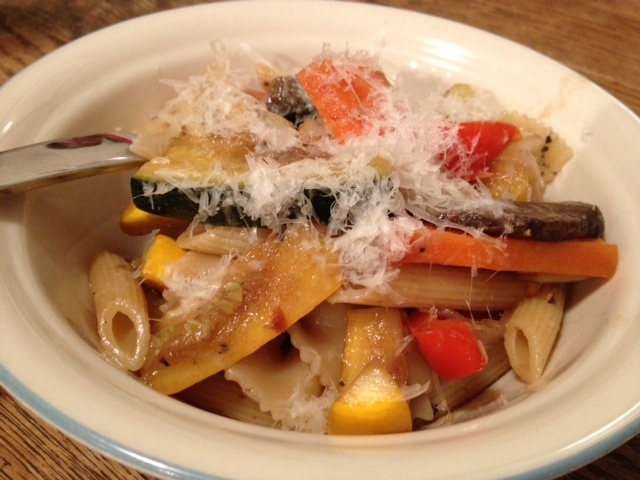 The other night, I adapted this Pasta Primavera from Giada de Laurentiis. (I still hope one day we can be best friends.) The recipe was simple: roast assorted vegetables with herbs and oil, add to pasta, top with Parmesan cheese. Since my veggie selection didn’t match with the ingredient list, I just used what I had: a squash, zucchini, portabella mushroom, spring onion, a sad half of one carrot, red pepper and two Roma tomatoes hiding in the back of the freezer. The great thing about a recipe like this is that it’s a template — you could really use whatever you have on hand by following the same techniques. I also added a splash of balsamic vinegar, because really, it makes most things better. For leftovers, I topped a bowl of the pasta with a spoonful of roasted garlic goat cheese from the farmers market, which melted into a creamy sauce. Roast any veggies you have on hand to make Giada’s Pasta Primavera. On a large heavy baking sheet, toss all of the vegetables (Follow these guidelines or use whatever you have in the fridge! Just keep a good ratio of veggies to pasta.) with the oil, salt, pepper, and dried herbs to coat. Transfer half of the vegetable mixture to another heavy large baking sheet and arrange evenly over the baking sheets. Bake until the carrots are tender and the vegetables begin to brown, stirring after the first 10 minutes, about 20 minutes total. Roasted garlic goat cheese sounds like the best sauce ever! Thanks for this good idea.